Otitis external is an inflammation of the external ear canal that begins at the outside opening of the ear and extends inward to the eardrum. Causes include bacteria, fungi, ear mites, accumulation of wax, thick or matted hair in the ear canal, debris, impaired drainage of the ear, and infections from elsewhere in the body. The ears of dogs (especially those with pendulous ears) and cats are ideal for the growth of bacteria and fungi because they are moist and warm, and contain wax and other debris. The funnel shape of the ear canal effectively traps debris, further complicating treatment of infections. In some dogs the inflammation of the ear canal becomes so great that treatment with medicine can no longer reduce the inflammation to the point that the ear can behaves like an abscess that cannot be drained. When this cannot be relieved it may be best to surgically open the canal so that infection is no longer trapped in the canal. Lateral ear canal resection can do this by opening up the horizontal portion of the ear canal as pictured here. 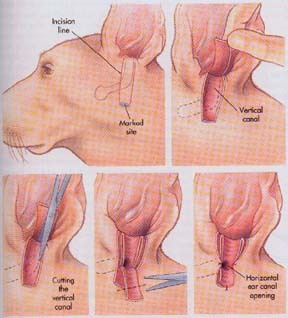 After the surgery is performed it is important that your pet be prevented from scratching out the sutures. If your pet scratches at the ear canal excessively applying a Elizabethan collar can prevent damage to the incision. After the ear canal incision heals you should watch the canal that it remains dry and free of inflammation. If inflammation occurs or drainage from the canal opening occurs it should be reported to your veterinarian.. The surgical site should be rechecked in about 2 weeks and again several months after the surgery as a minimum..